The Carlson Design Ultra-Sonic Cutting Head is world’s simplest sealed-edge cutting solution when speed and accuracy are essential. We ensure a standardized and easily supported system by integrating a JTE Machine Ultra-Sonic cutting tool onto our rigid Pro PTi-132″ gantry. 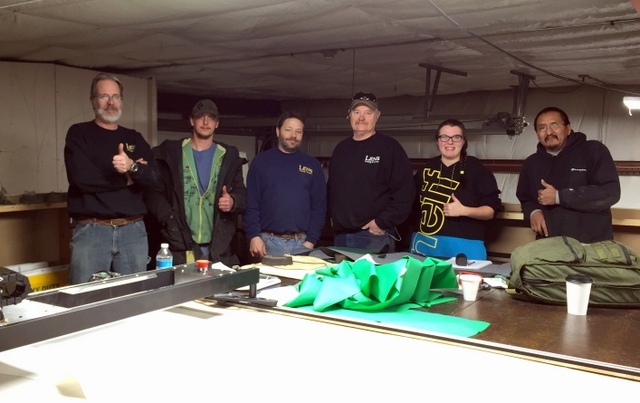 At 132″ wide, we can Plot/Cut up to 120″ (3m) wide material. The system rides on a 11’x16′ Phillocraft vacuum table, with a custom-drilled metal cutting surface and is driven by our Plotmaster Software suite — including autonesting. We saved days, not hours on our first cuts with the Plotter/Cutter. And while Greg was right, it did take him a little time to cut his first boat cover, it didn’t take THAT much time. He cut his first cover in less than 3 months after automating – mainly because they were so busy taking advantage of the other unexpected advantages of their new Plotter/Cutter system!